Twelve years ago, former chair of the Campaign for Sensible Transportation, Paul Elerick, led the charge to vote down a local measure to widen Highway 1. The push to widen the highway has reappeared now with Measure D, and this time around, Elerick is aligning himself with those he once fought against. 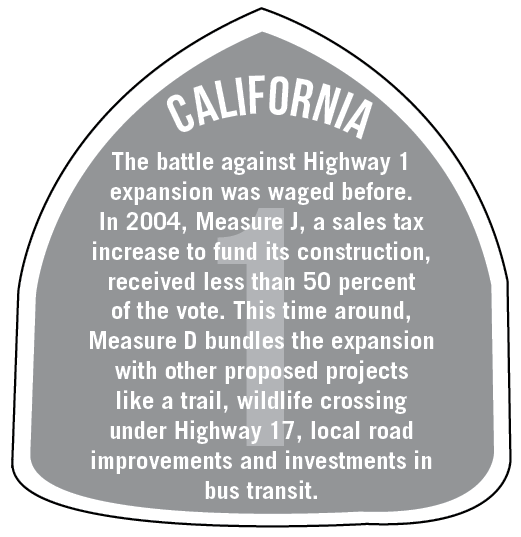 Legislators crafted Measure D to mitigate the transportation issues in the county. Their plan for Highway 1 is the cornerstone project and the point of biggest contention among the opposition — specifically Widening Won’t Work, an offspring of Elerick’s former group. The measure proposes a half-cent increase in sales tax for 30 years throughout the county, potentially bringing in $17 million in added tax revenue per year, totaling over $500 million. Along with adding auxiliary lanes to Highway 1, it proposes several projects ranging from pavement repair and pedestrian trailways to providing accessible transportation for seniors and people with disabilities. Santa Cruz County Regional Transportation Commission (SCCRTC) crafted Measure D. The SCCRTC is staffed by all five members of the Santa Cruz County Board of Supervisors, three appointees from the Santa Cruz Metropolitan Transit Board of Directors, representatives from each of the four cities and a non-voting representative from the California Department of Transportation (Caltrans). County Supervisor Bruce McPherson said solving the county’s transportation issues requires a multi-pronged approach and congestion will only get worse if the highway is not expanded. The measure has a long roster of endorsements from local agencies, non-profits and politicians, but support is not unanimous among the Santa Cruz community. 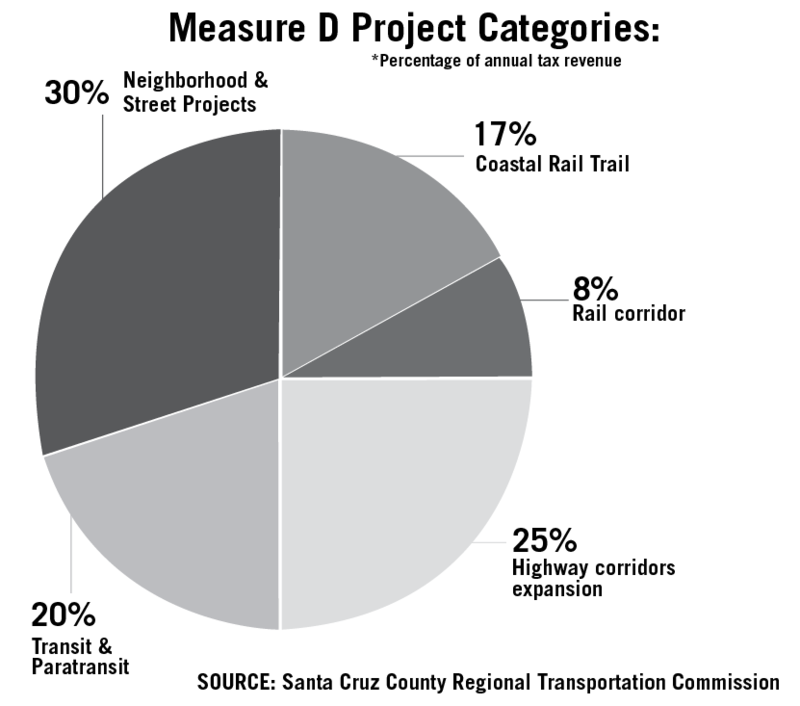 The 20 to 25 Santa Cruz residents who run Widening Won’t Work oppose the bill solely for its proposed widening of Highway 1, a project that would cost a quarter of the total sales tax revenue funds. Widening Won’t Work spent the first half of the year campaigning to remove the highway expansion from the measure with no luck. Now the group is campaigning against the entire measure, even though current chair Rick Longinotti said they support all the other proposed projects. As their name suggests, Widening Won’t Work argues adding auxiliary lanes won’t help to ease traffic congestion, citing a 2015 Environmental Impact Report (EIR) jointly prepared by Caltrans and the Federal Highway Administration. It claims the report’s findings prove auxiliary lanes won’t relieve congestion. However, in an email, McPherson said the group is selective in choosing numbers and are using outdated figures. Aside from the interpretations of the EIR, Widening Won’t Work believes the county shouldn’t invest in automobile infrastructure projects whatsoever. The group’s website says a bill can be passed without the highway widening project that is environmentally friendly and effective in reducing urban sprawl. However, its strict opposition to the Highway 1 overshadows the other projects included in the measure, which Longinotti expressed no issues with, including a wildlife crossing under Highway 17 and the creation of a 32-mile coastal trail for pedestrians, bicycles and non-auto transport. Although Widening Won’t Work rejects Measure D primarily on environmental grounds, about a dozen local environmental groups endorsed it, including the conservationist nonprofit Land Trust of Santa Cruz County. Corwin hopes the measure’s projects will incentivize people to get off the roads and use alternate forms of transportation like the proposed 32-mile trail that would connect Davenport to Watsonville. The trail project would create a pedestrian and bicycle-friendly path parallel to the Coastal Rail Corridor. Twelve years after the failure of the former proposal, the widening of Highway 1 remains a controversial issue among community members. The last poll released in June showed support for the measure hovering at 68 percent.